It is waterproof, dust-proof & coffee proof flexible keyboard that can be used for different purposes like gaming, typing etc. In fact it's virtually indestructible, you can take it easily in your bag. You can even roll this flexible silicone keyboard up like an enchilada and it will still be fine and dandy when it unravels. Roll it up and take it with you! It's manufactured in highly durable fully sealed silicone, making it ideal for extreme weather conditions. Heck, your roll-up keyboard even works under water should the need arise. While no sharp edges and soft comfortable keys mean that this cool portable keyboard not only fits comfortably in your briefcase or rucksack, it's great for kids too. Even the keys are silent! 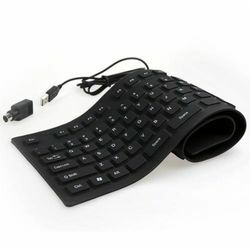 The shift away from traditional hard keyboards also means that this flexible USB keyboard is built with a low design which creates an ergonomic work posture. This encourages straight wrists, minimises wrist flexing and reduces the effects of Repetitive Strain Injury (RSI).